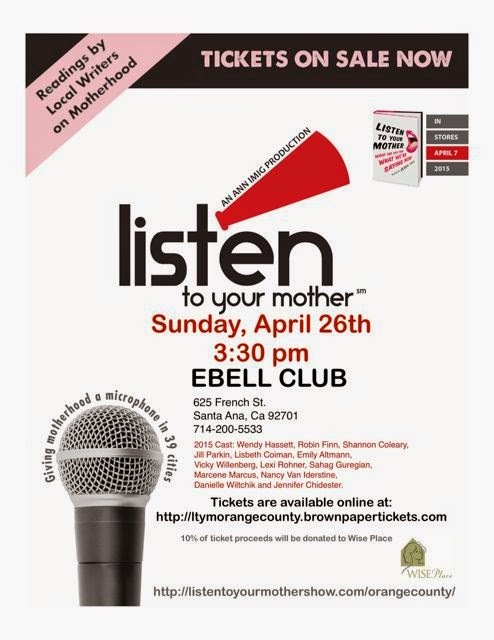 I am honored to say that I have been selected to read at the 2015 production of Listen To Your Mother (Orange County)!! If you are available this weekend, come see me read! Created by Ann Imig (Ann’s Rants), Listen to Your Mother began in 2010 and is now produced in 39 cities nationwide! LISTEN TO YOUR MOTHER offers an opportunity for 12 people to share their voice from a moment in their journey through parenthood. Not only is this a chance to go with each reader as they portray motherhood through their journey, but LISTEN TO YOUR MOTHER gives back to the community by supporting those in need. This production will be supporting the WISE Place in Santa Ana. I'll be there, girlfriend; cheering you on and all the other incredible women sharing a piece of themselves that day.